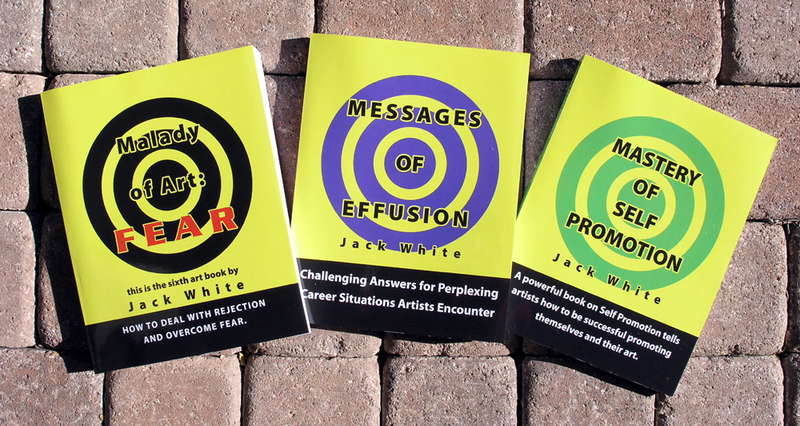 WOW, I thought 15% off was great but TODAY ONLY you can SAVE 35 PURR-CENT on all JACK WHITE Art Marketing Books at Lulu.com! 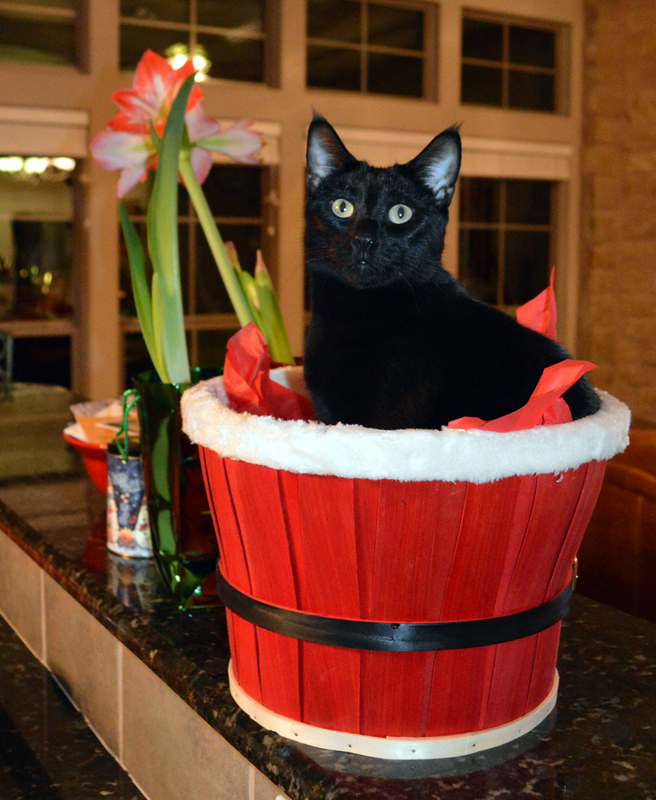 AND….Jack’s books make GREAT CHRISTMAS GIFTS! TODAY ONLY, Tuesday, November 27 until 11:59 PM Eastern Time you can get 35% OFF on ALL eight Jack White Art Marketing books at Senkarik.com. Just use the coupon code CM35 when you checkout. Act fast to take advantage of this great offer from Lulu.com, Mikki and Jack’s online distributor. This offer ONLY applies to the printed version of his books, not the downloads. For those of you selling on eBay or thinking about making the plunge this book tells how Jack taught Mikki to do it. CLICK HERE to order the hard copy. 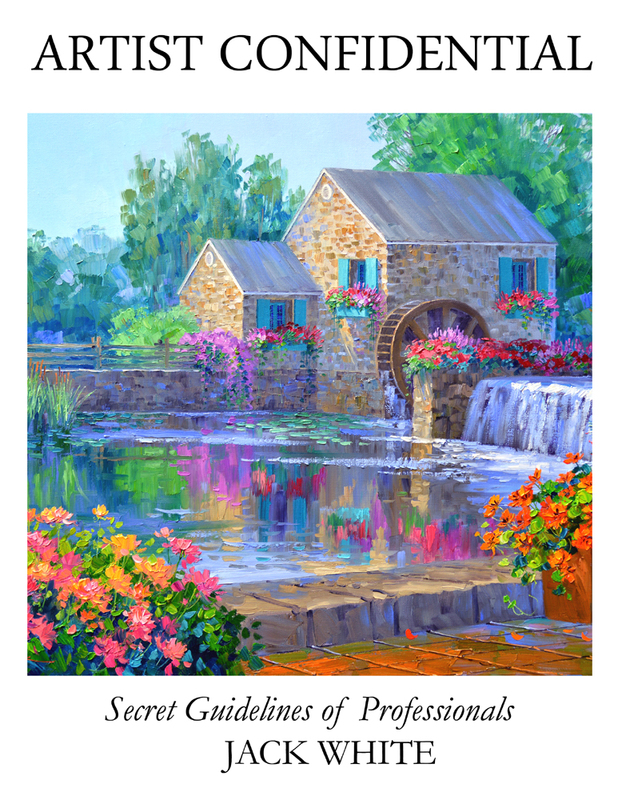 Jack’s book, ARTIST CONFIDENTIAL: Secret Guidelines of Professionals would make a Wonderful Christmas GIFT for that special artist in your life. It’s chock full of practical ideas and helpful tips for artists, a must for anyone making art! CLICK HERE to order ARTIST CONFIDENTIAL in hard copy. The online distributor of our books has offered this special promotion for our readers and we want to make it available to all of you. 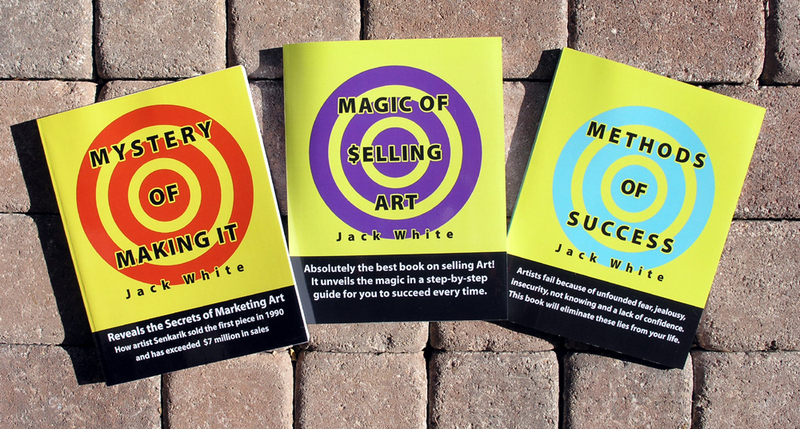 Here is your chance to purchase any or all eight of Jack White’s Art Marketing Classics in the print version at 35% OFF. BUT HURRY, the offer ends TONIGHT, Tuesday November 27 at 11:59 PM Eastern Time. To get the savings use the code CM35 when you checkout. 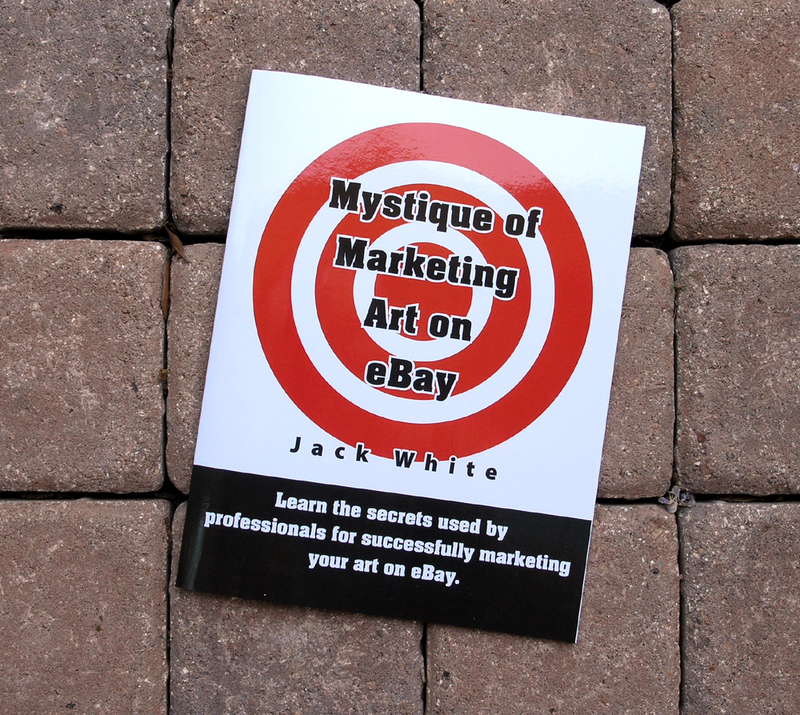 Just CLICK HERE to buy Jack’s Art Marketing Books. 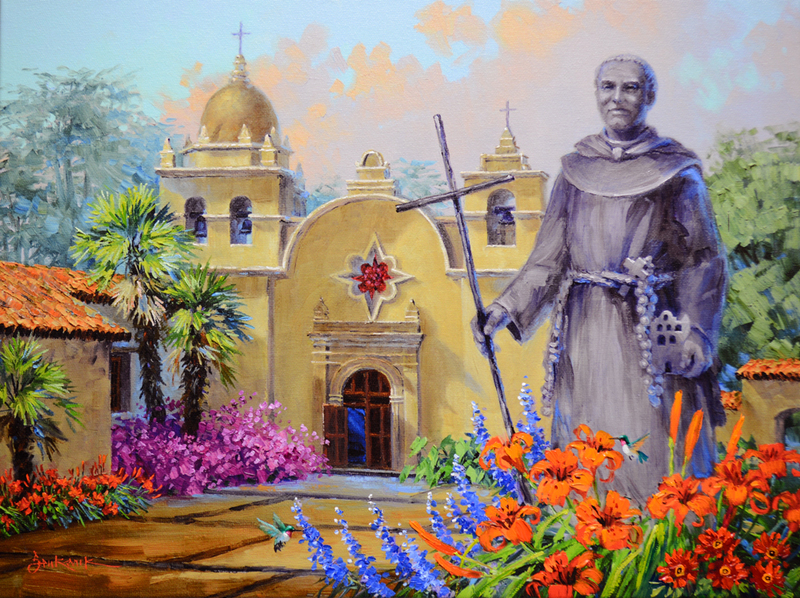 Today I’m working on a LIMITED ORIGINAL Hand Embellished Giclee on Canvas of a painting I finished recently, “The Spirit of Saint Junipero Serra Lives On”. Why do we call these LIMITED ORIGINALS? 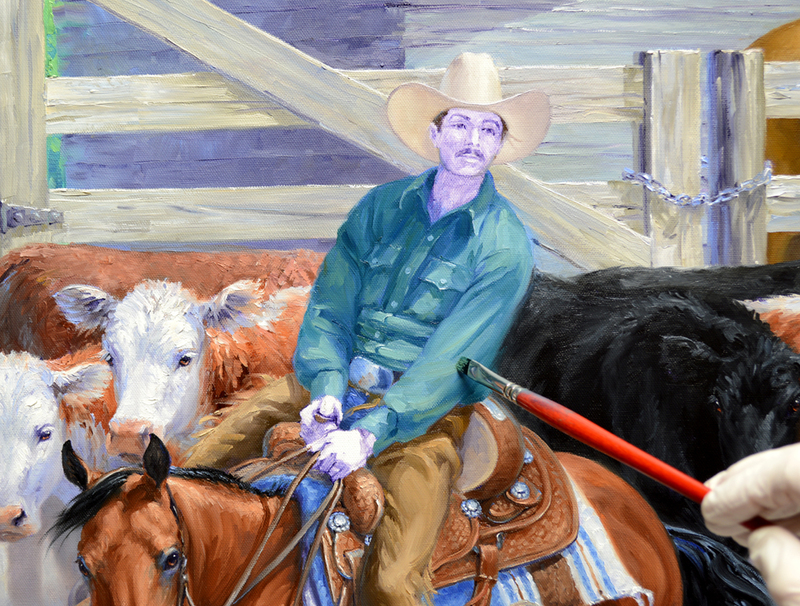 Jack came up with the term because I paint extensively on each colorful, high resolution, digital image with oils. I may change the colors of flowers or add more; no two are exactly alike. The options are limitless! 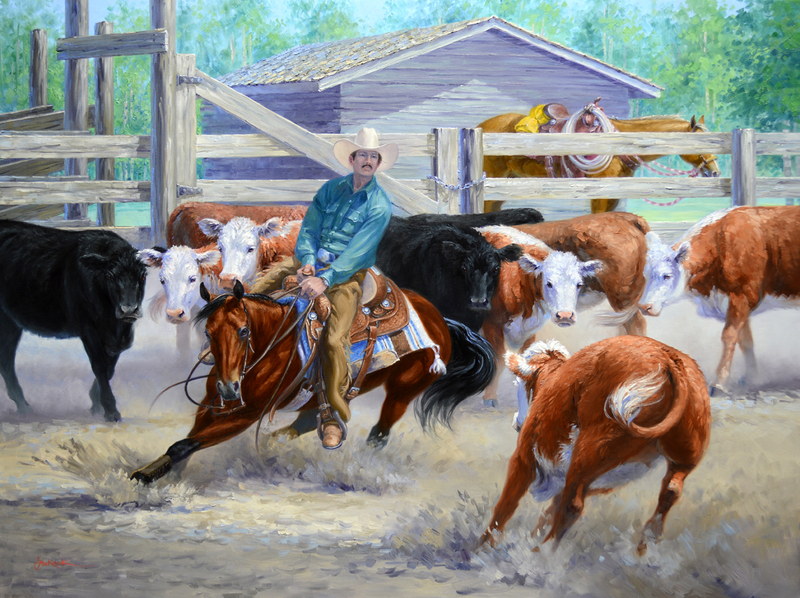 And every piece is personally signed on the front, just like my original oil paintings. So even though each is part of a limited edition, every single piece is original. 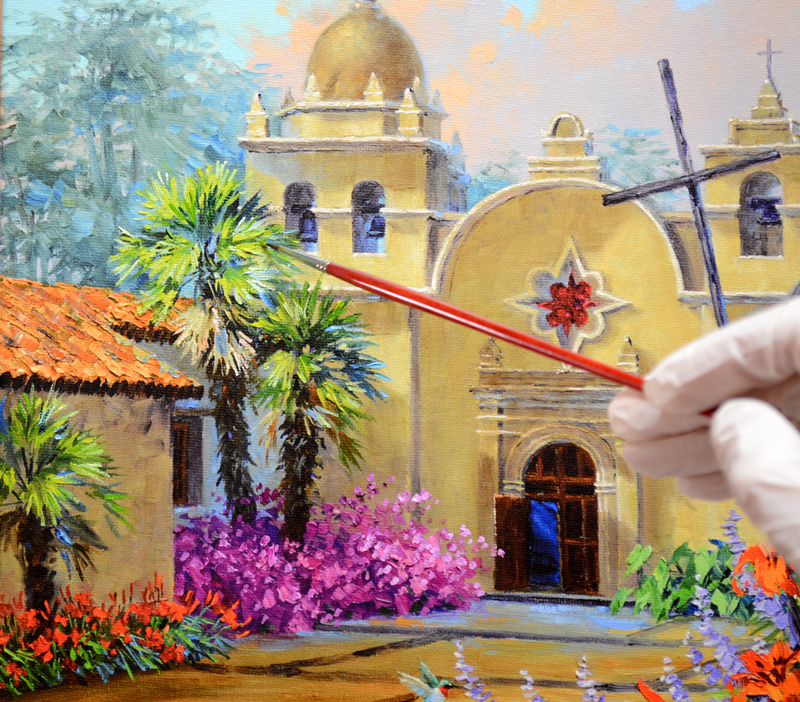 The dome and architectural features of the Carmel Mission are repainted, giving them extra dimension. Please keep in mind as you read through my blog, you may click on any of the images to see enlargements. 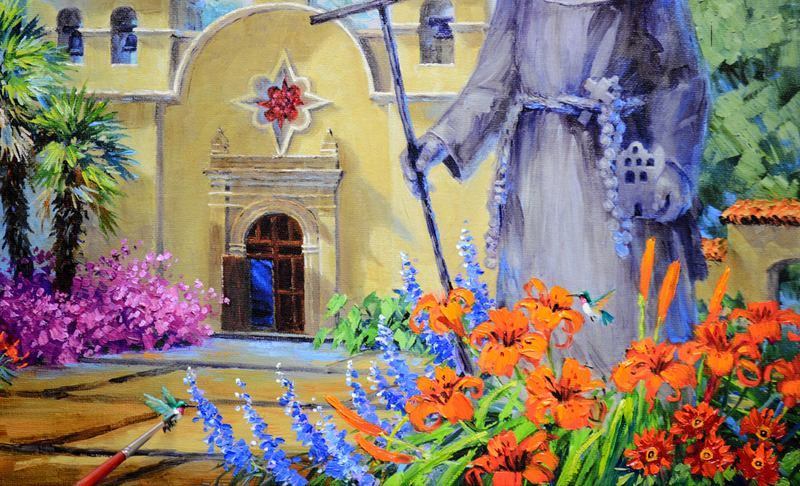 I’ve repainted the Orange Day Lilies and Magenta Bougainvillea along the left side of the courtyard. Next, texture is added to the large, swaying fronds of the palms using several mixtures of Pthalo Blue + Cadmium Yellow Medium. VIDEO DEMONSTRATION: Embellishing the Flowers. 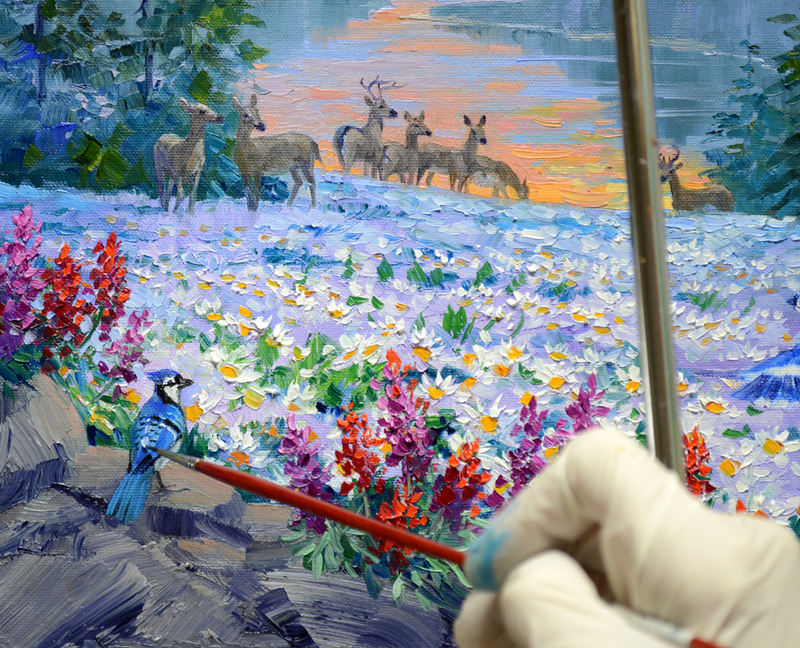 It’s fun to repaint the tiny hummingbirds sipping nectar from the brilliantly colored flowers. 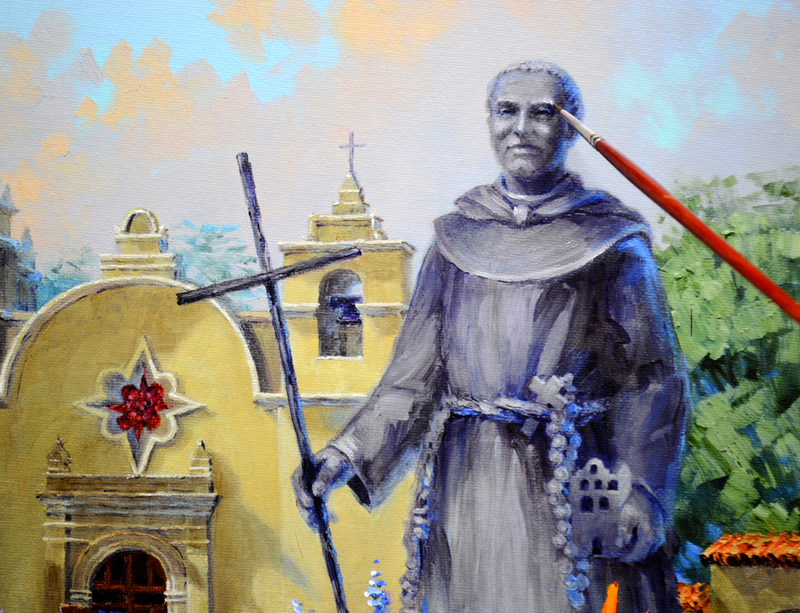 Highlights and details on the sculpture of Saint Serra are now accentuated. 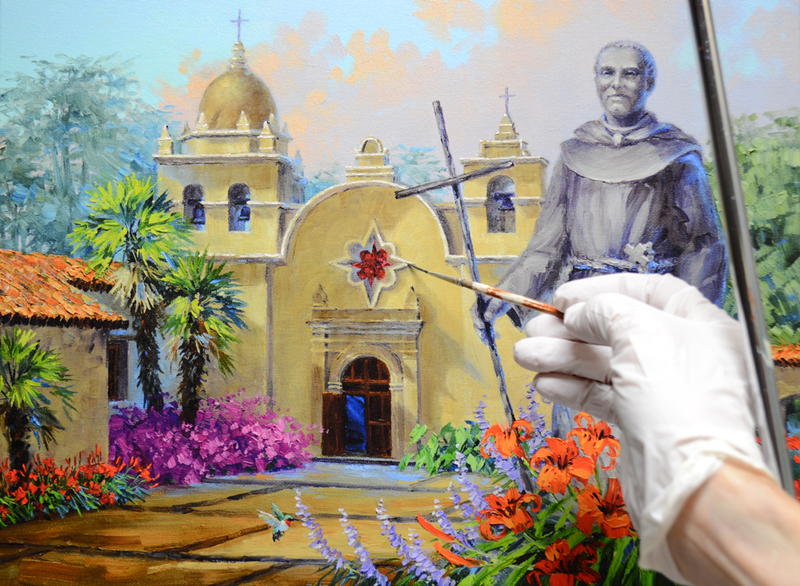 This LIMITED ORIGINAL of “The Spirit of Saint Junipero Serra Lives On” is going to be presented to Bishop Greg Kelly, the Auxiliary Bishop of the Diocese of Dallas. As I mentioned in the video, we changed the colors of the flowers to personalize the LIMITED ORIGINAL specifically for him. That’s the fun of my hand embellished giclees on canvas! Thank you for following along! If you would like to receive an email every time I publish a new post please feel free to subscribe to my blog. 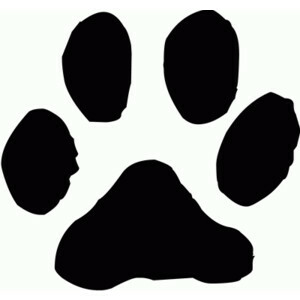 CLICK THIS LINK and scroll to the upper right side of the page. You will see a heading EMAIL SUBSCRIPTIONS. Just enter your email address and click the button “Sign me up!” It’s easy. And if you enjoy my blog please CLICK the FaceBook LIKE Button. As we say in Texas, “Much Obliged! 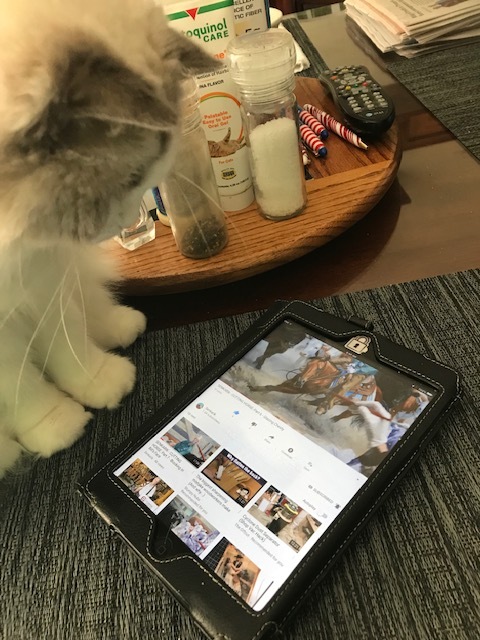 Pete and Julie, collectors of mine, sent the following video of their Rag Doll Kitty viewing my painting demonstration of the cutting horse on his cell phone. Enlarge the video and watch what she does when my hand comes into the picture. I shared this with all of my friends at Thanksgiving Dinner, we were rolling with laughter. ENJOY! Jack and I have always considered Norman Rockwell to be a Master Artist. I grew up admiring Rockwell’s paintings on the covers of the Saturday Evening Post Magazine; his attention to detail was amazing. I’ve used this painting in one of my Thanksgiving greetings before but it’s a favorite. Definitely worth repeating! It portrays the essence of those heartwarming moments in the kitchen, catching up with friends and family you haven’t see in ages, that make Thanksgiving so wonderful. I’m very blessed with all of your loving support! I wish you a Happy Thanksgiving filled with Laughter, Love and Hugs. And GO COWBOYS! Let’s start working on the wildflower meadow. 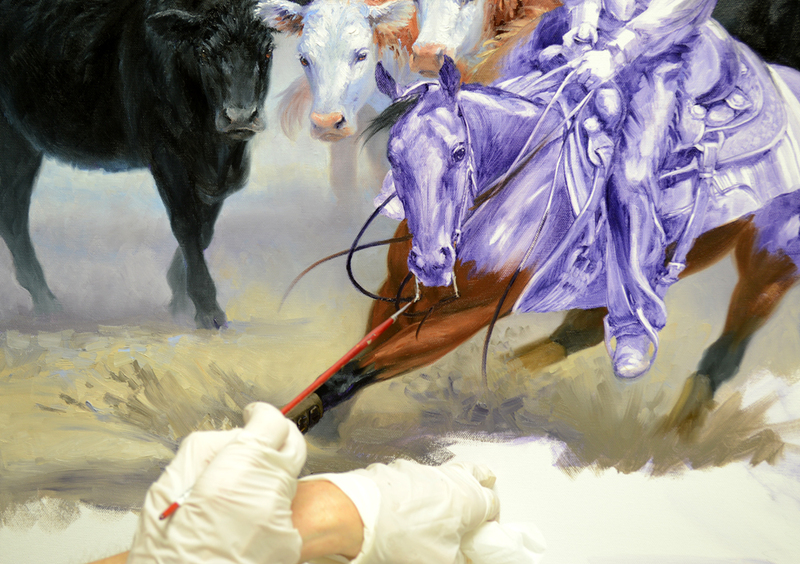 The entire field is covered in mixes of White + Ultramarine Blue, White + Ultramarine Blue + Dioxazine Purple and White + Dioxazine Purple. The bluest (coolest) mixture is used for the most distant part of the meadow. Working forward the mix with both blue and purple is applied in the middle, reserving the warmest mixture of White + Dioxazine Purple for the closest flowers. The paint is scumbled, or smooshed, together to make the transitions gradual. I don’t want distinct bands of color. This picture shows how the image extends over the edge and on to the side of the gallery wrap canvas. 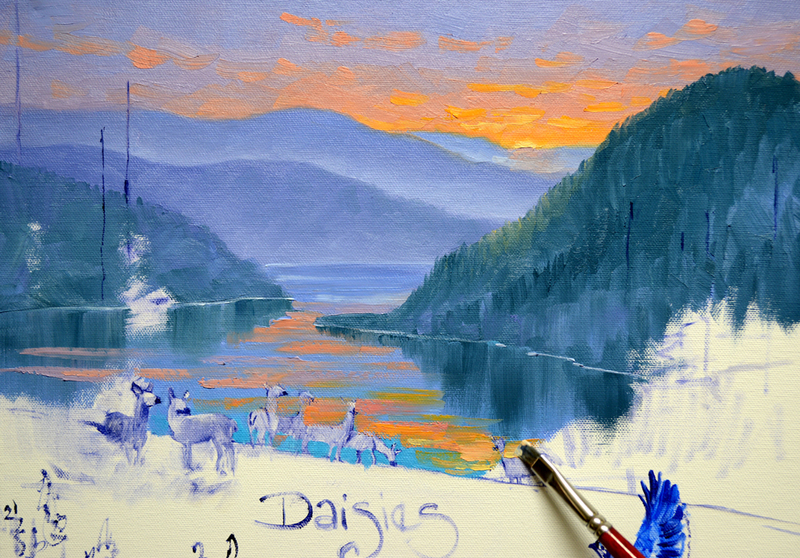 I begin adding lighter shades of the three mixtures to indicate the clumps of flowers illuminated by the lowering sun. Please remember, you may click on any of the images to view them larger. 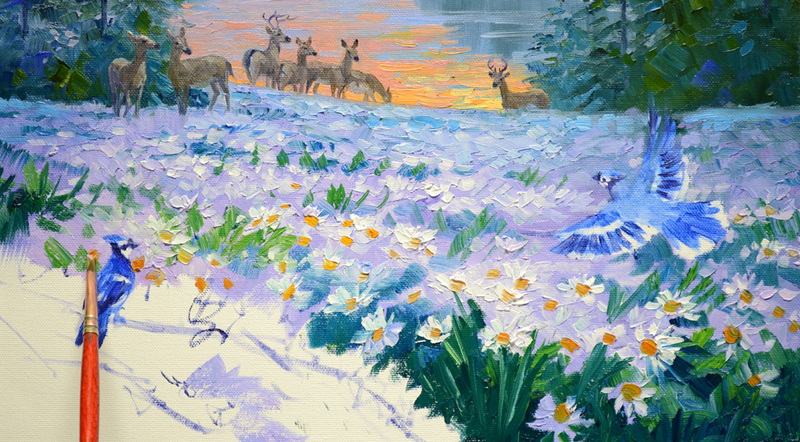 Now the foliage of the Daisies is blocked in. 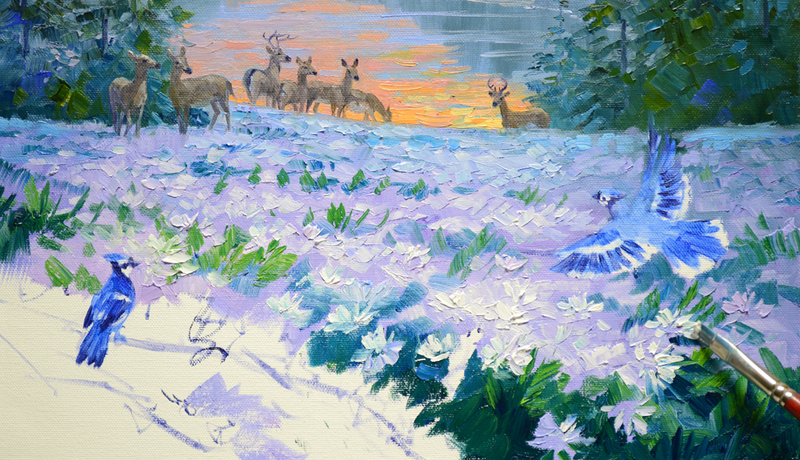 At the back of the field the leaves are cooler mixes of White + Pthalo Blue + Cadmium Orange (more blue). 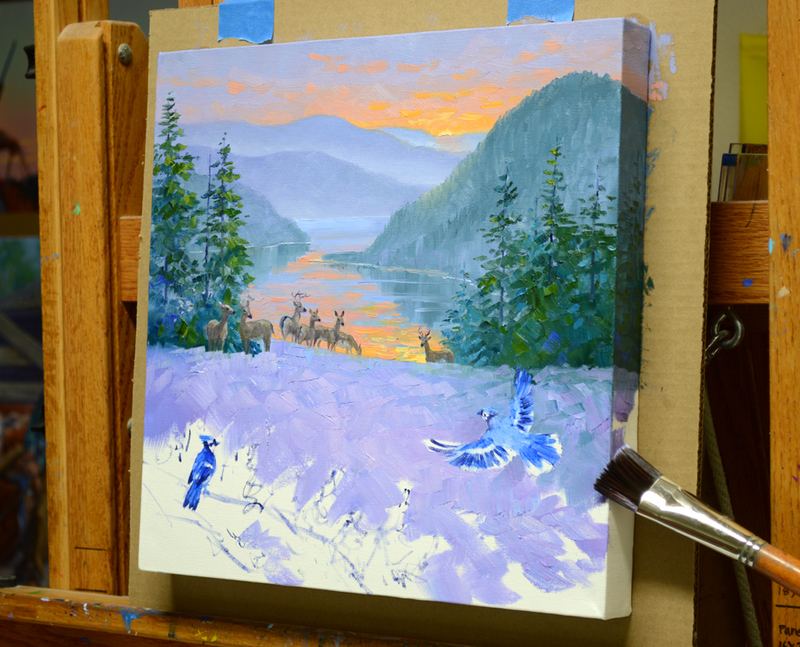 At the front the greens are made of several combinations of Pthalo Blue + Cadmium Orange + Lemon Yellow. 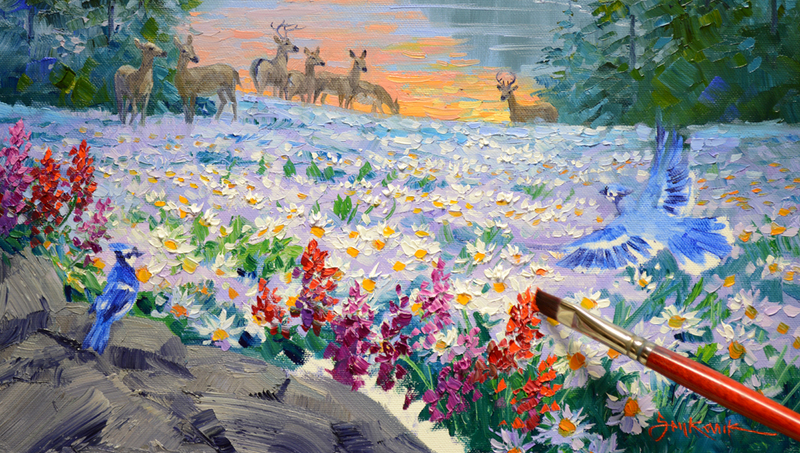 Pure White is used to apply the final highlights on the sunlit Daisies. Yellow centers are mixes of Cadmium Orange + a tiny bit of MUD (2 parts Ultramarine Blue + 1 part Alizarin Crimson), Cadmium Yellow Medium + a touch of MUD and pure Cadmium Yellow Medium. Red and Magenta Lupines surround the outcropping of rocks in the foreground. 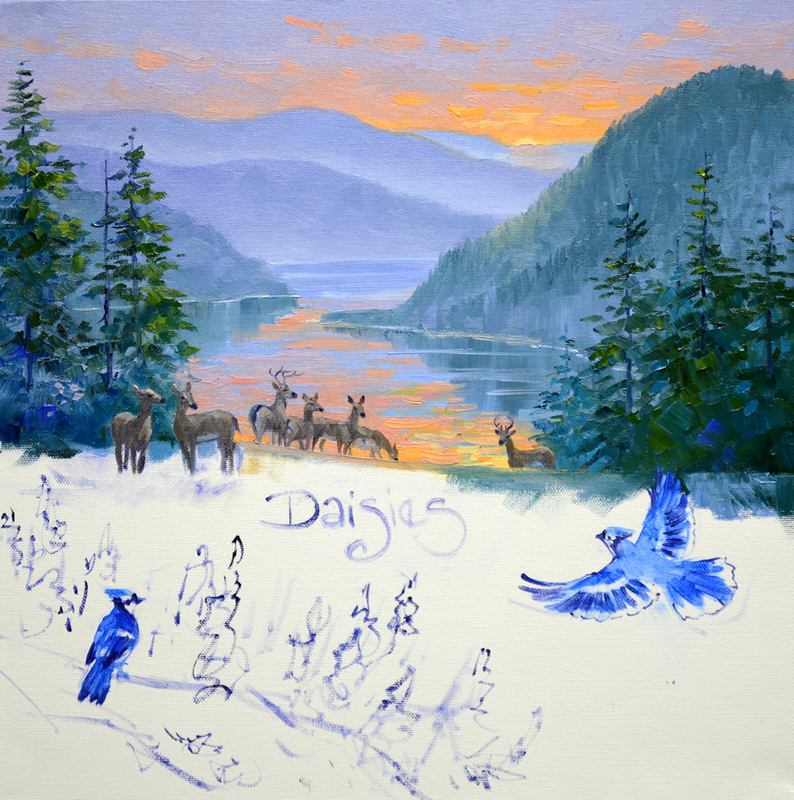 Mr. Blue Jay perches on the warm rocks, a perfect place to admire the beautiful mountain sunset. 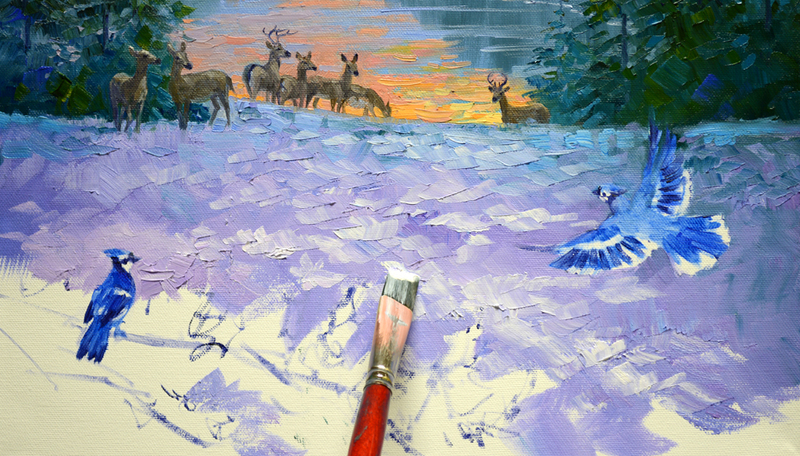 His brilliant blue feathers are painted with mixes of Ultramarine Blue + White, Cobalt Blue + White and a few touches of Pthalo Blue + White. My oil color recipes for the sky are: #1. 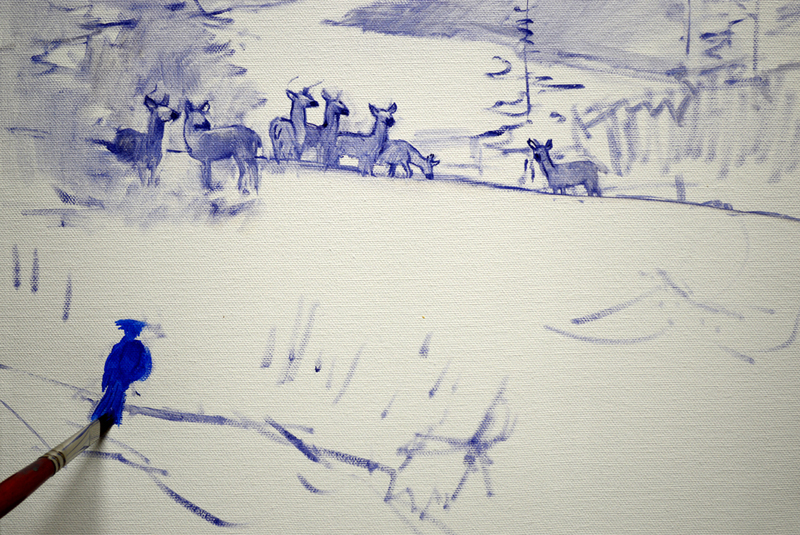 White + MUD (2 parts Ultramarine Blue + 1 part Alizarin Crimson). #2. Mixture #1 + more White + a little Alizarin Crimson. #3. White + MUD + Alizarin Crimson + Cadmium Red Light. #4. Mix #3 + more Alizarin Crimson. #5. Two shade of White + Cadmium Orange + Cadmium Yellow Medium. 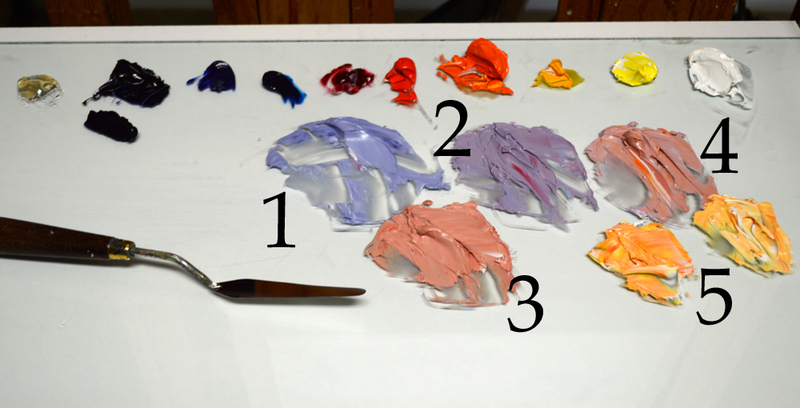 The basic colors of our Double Primary Palette are along the top. 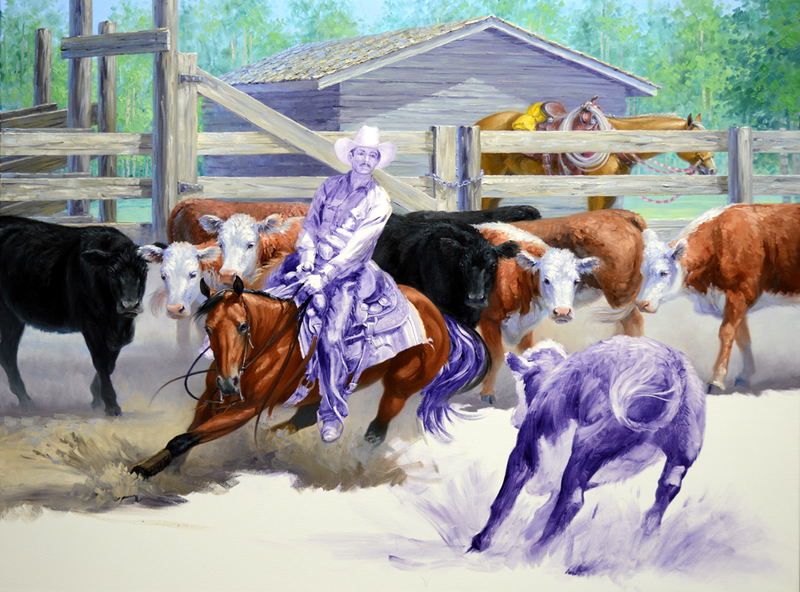 To learn more about our color mixing system that Jack developed, CLICK HERE. Painting forward from the sky each layer of mountains is made progressively darker. The most distant one is bluer, or cooler, so it recedes. Then the horizon line of the water is dragged into the wet paint at the base of the mountain at the far edge of the lake. Oh, don’t forget, you may click on any of the images to view them larger. We can see the shapes of the trees on the closest mountain. The setting sun warms the tops of the trees directly below. 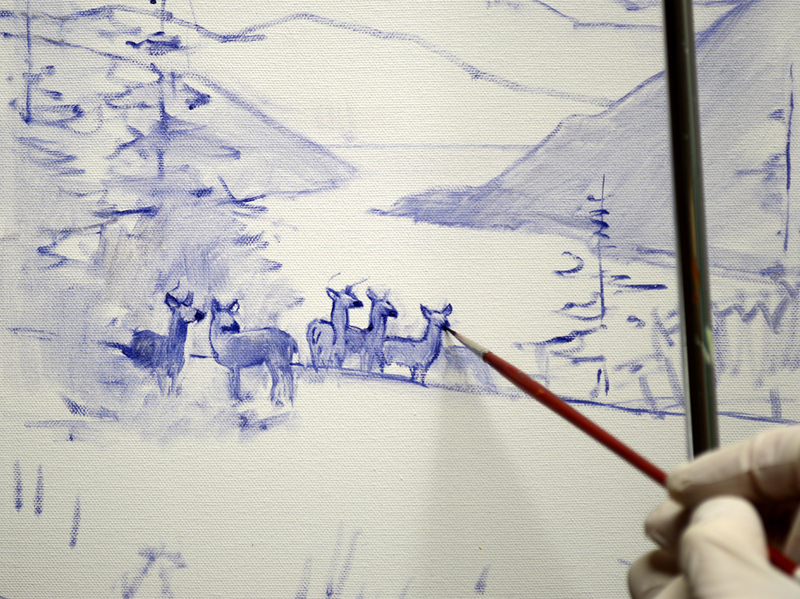 The water is carefully painted around the sketches of the deer. The reflections of the mountains and sky are then painted into the blue water. The buck at the far right is silhouetted by the brilliant color of the setting sun reflecting on the water behind him. The upright lines are where the trunks of the trees at the back of the meadow will be. 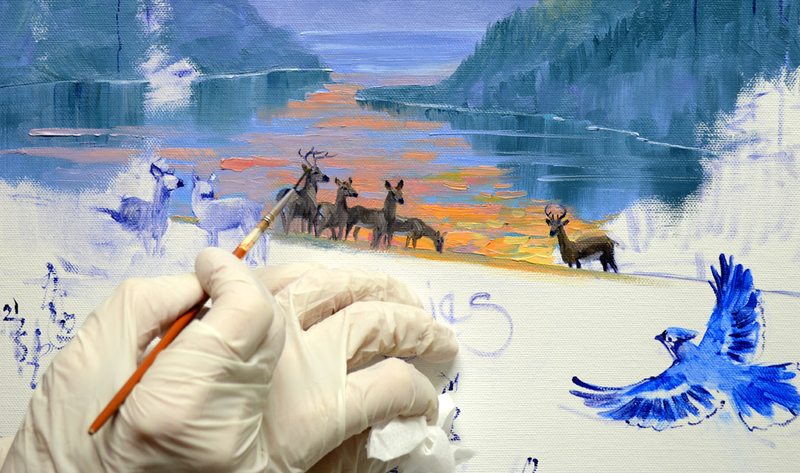 My left hand is braced against the unpainted portion of the canvas to steady my right as I continue to add the details on the herd of deer. The warmer, darker greens in the foreground trees make the cooler greens and blues of the mountains in the distance fall back. We’re off to the mountains today. This is also a commission, completely different from the cutting horse portrait I just finished. 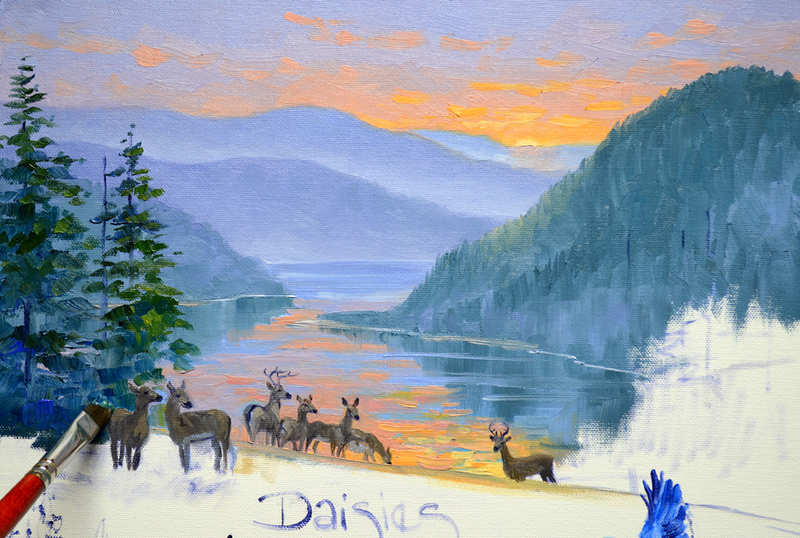 The collector asked for a mountain sunset piece with a herd of deer in the background, wildflowers and blue jays! 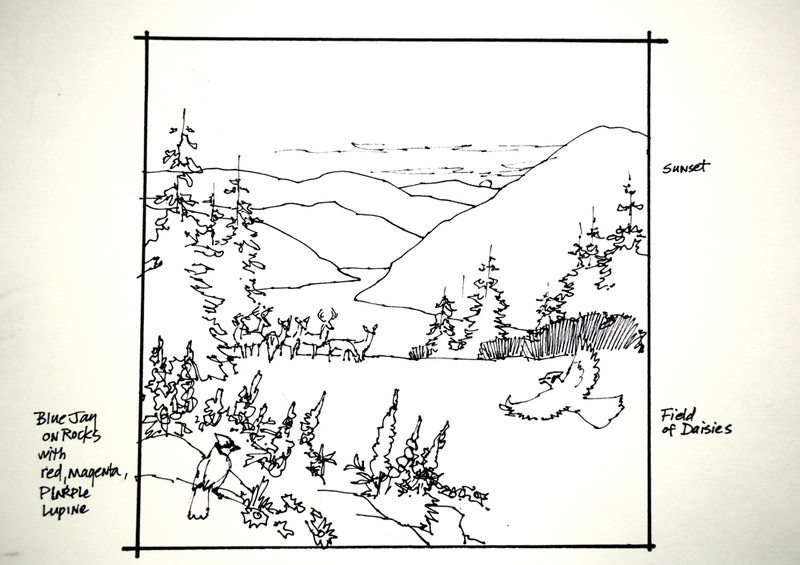 She sent several images of mountain scenes that she liked so here’s the initial pen and ink sketch I came up with. 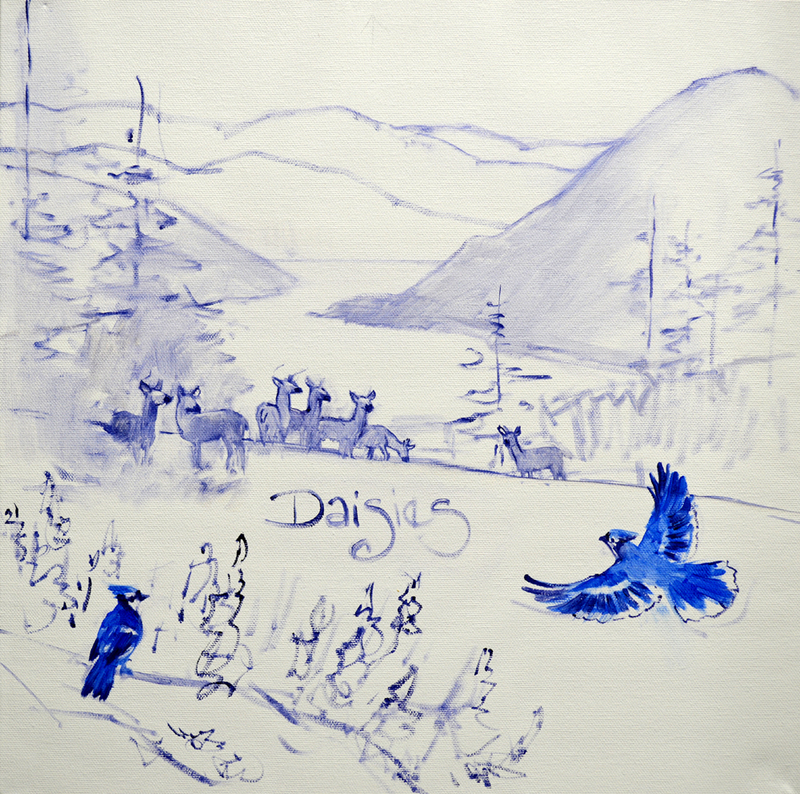 The outlines of the mountains are drawn with an oil wash of MUD (2 parts Ultramarine Blue + 1 part Alizarin Crimson) + Liquin. Sunset reflections on a lake, far in the distance, will accentuate the group of deer at the back of the wildflower meadow. 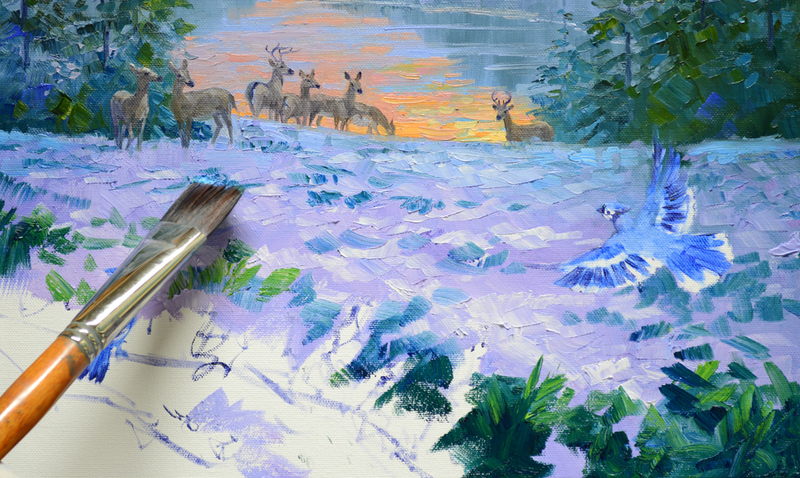 The basic shapes of the deer are blocked in first. 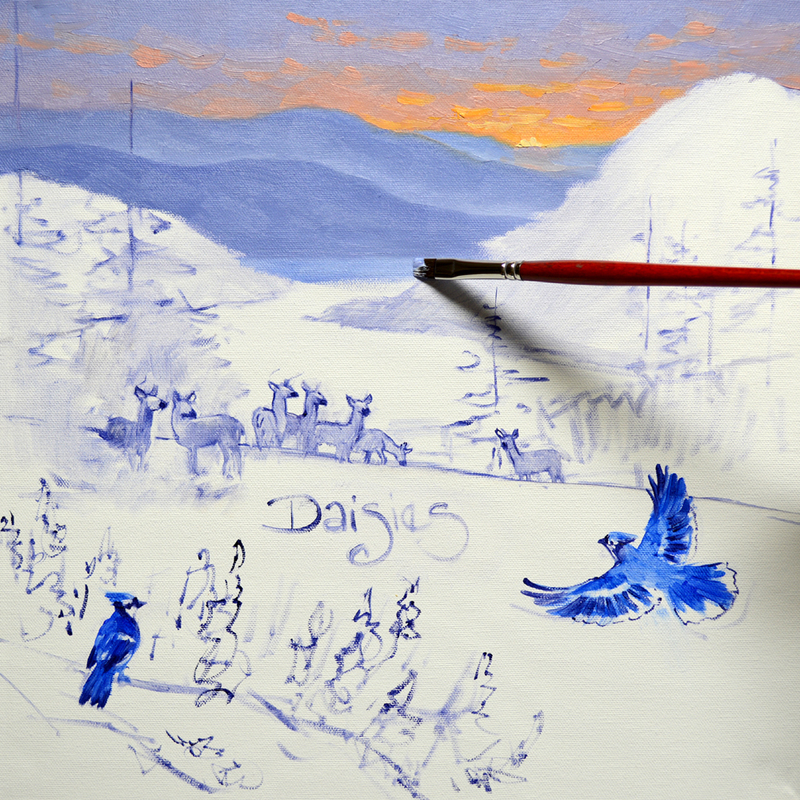 Once the placement of the deer is established, they are drawn more accurately. 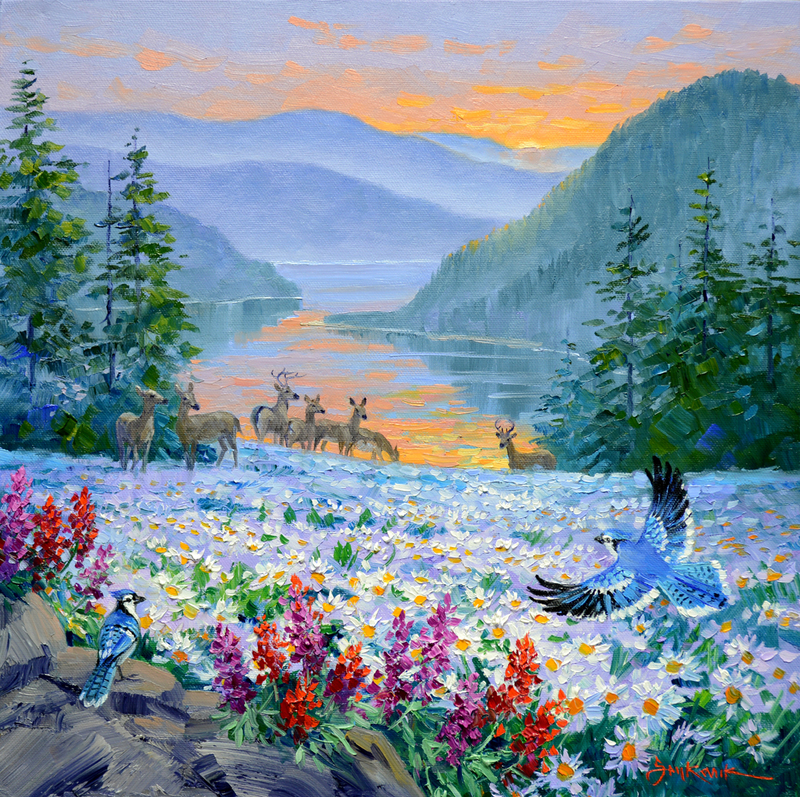 A Blue Jay is standing on an outcropping of rocks in the lower left corner, surrounded by Lupine. Another flies into the painting from the right, to join up with his buddy! We’re ready to begin painting, I’ll start with the sky in our next session. 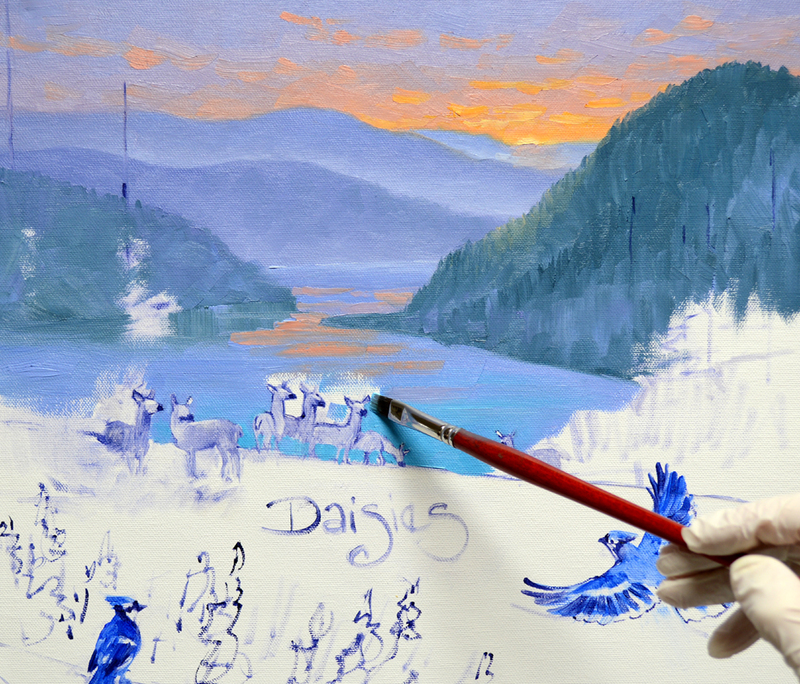 I hope you’ll come back and follow along because I’ll have a video of painting the sunset! If you would like to receive an email every time I publish a new post please feel free to subscribe to my blog. CLICK THIS LINK and scroll to the upper right side of the page. You will see a heading EMAIL SUBSCRIPTIONS. Just enter your email address and click the button “Sign me up!” It’s easy. 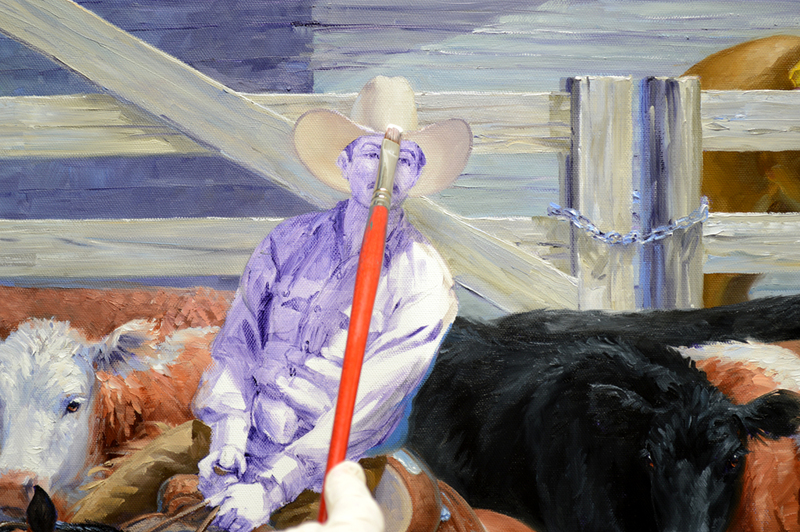 The straw cowboy hat is painted with warm, creamy colors made of White + a bit of Cadmium Orange + a tiny touch of Ultramarine Blue + a little MUD (2 parts Ultramarine Blue + 1 part Alizarin Crimson). More White is added into the lighter mixes while the darker ones have more MUD. Don’t forget, you may click on any of the images to view them larger. The dark shadows on Bill’s shirt are blocked in first, then the lighter portions. The last step is to come back and highlight the sunlit folds. A shadow from a cloud above darkens the foreground of the painting. 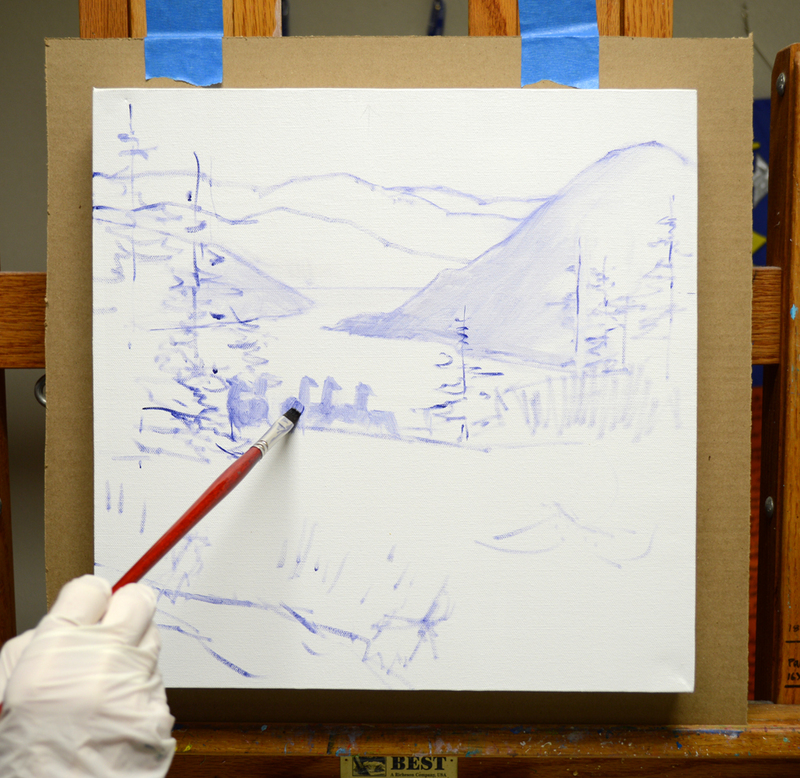 Jack taught me this “Threshold” technique which helps to give the feeling of depth in a painting. Think of going outside your home on a warm summer night, leaving the front door open to reveal the brightly lit interior. As you stand out in the front yard and look back at the house, the light serves to pull your eye across the darkness, over the “Threshold” of the door into your home. The same happens in our painting. The shaft of golden light illuminating the ground directly in front of Chesty, pulls your eye over the dark shadow, or “Threshold”, and into the middle of the painting. Thus giving the painting the appearance of dimension. 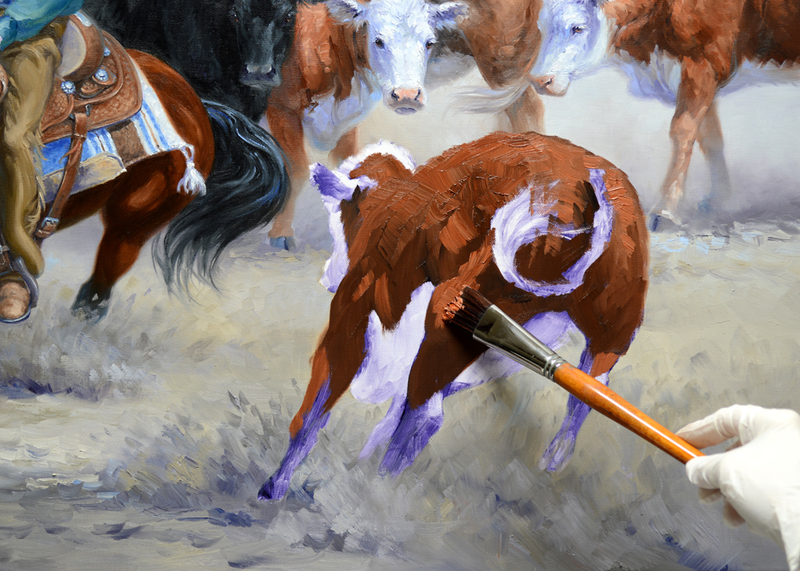 The heifer in the foreground is painted with several combinations of Burnt Sienna + White and Burnt Sienna + MUD + White. Her rough coat makes Chesty’s appear even more smooth and shiny. 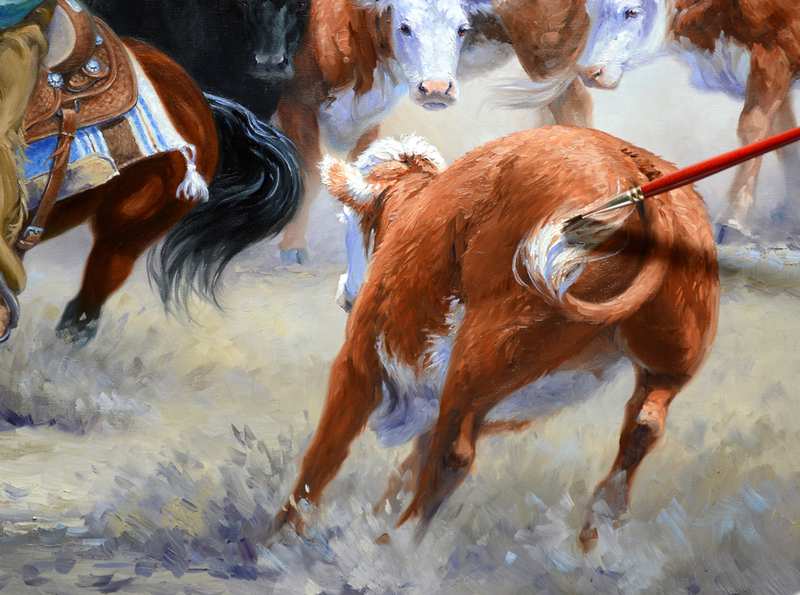 The white tail, dragged into the wet hip of the whirling cow, accentuates the action. VIDEO DEMONSTRATION: Blocking in Bill’s face. Paint mixtures left over from the face are used to delineate Bill’s hands. I still have one little thing left to do. After Bill’s face is completely dry I’ll need to come back and glaze it to make it just a touch darker. I’d rather err on the side of making it too light than too dark. It’s much easier to make the adjustments! 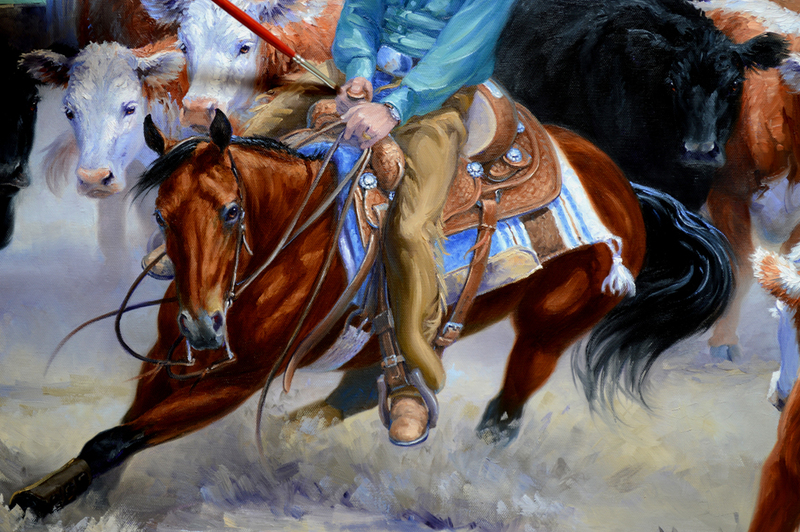 Then the painting will be ready to ship off to it’s new home, bringing Bill “Treasured Memories” of his beautiful bay mare, Chesty! I still have a little work to do on Chesty. After she is completely dry I’m going to glaze her coat with Burnt Umber + Liquin to mute and darken the color. So right now I’ll start on Chesty’s tack. 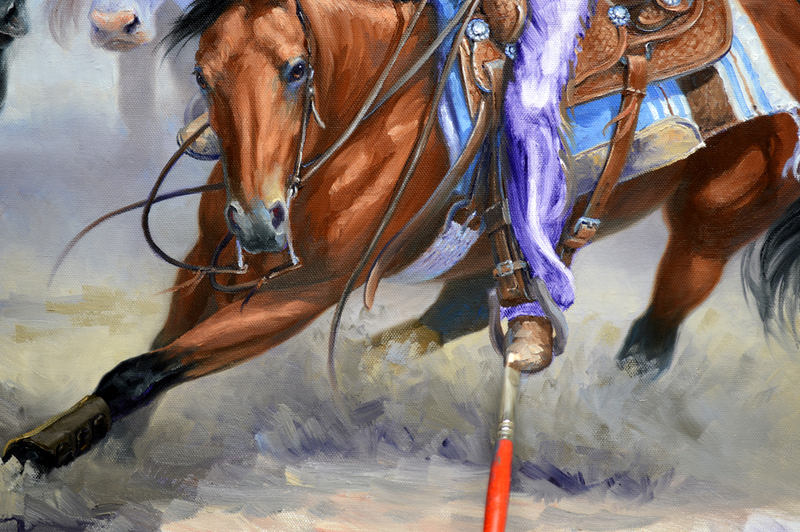 I mentioned the tassel on the saddle blanket that cast a shadow down the side of her hip in an earlier session. WELL…..here it is. The detail on the custom saddle is intricate and fun to delineate. I’ve added some Ultramarine Blue and White to the mixes left over from Chesty to use for the saddle. You may click on the image to view it larger. 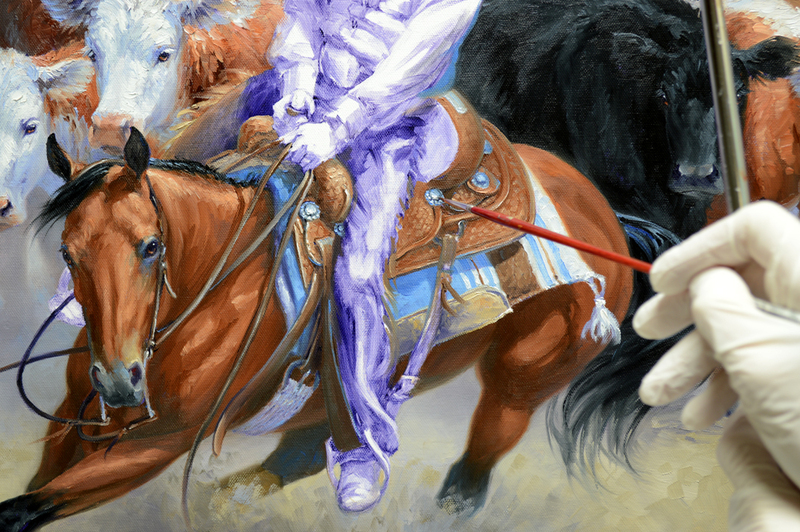 Silver conchos on the saddle are painted with mixtures of Ultramarine Blue + a bit of Ivory Black + White. 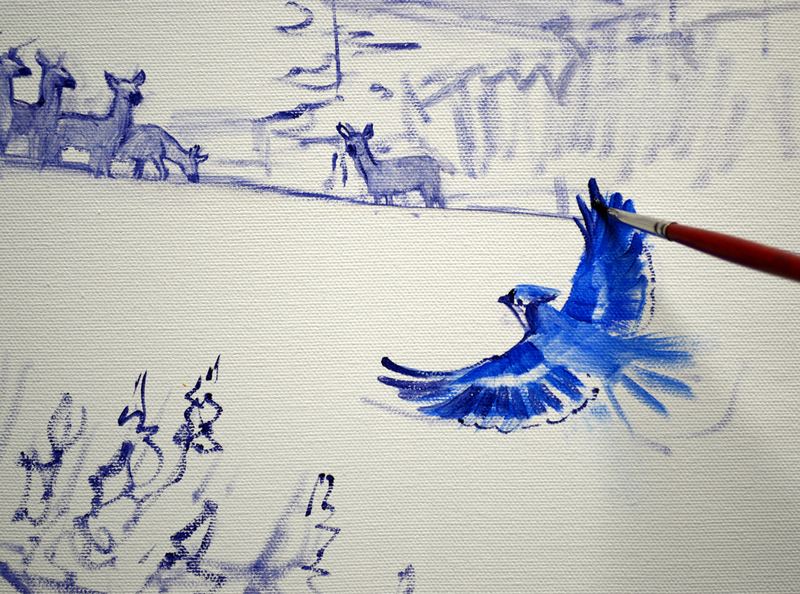 Then the highlights are added with a mix of White + a tiny touch of Ultramarine Blue. Some of the paint remaining from the saddle is used for Bill’s well worn boots. 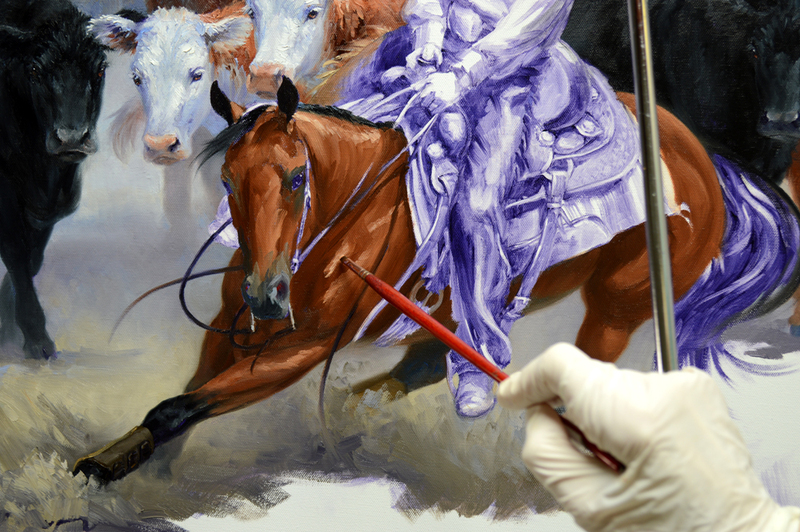 His chaps are blocked in with combinations in different proportions of MUD (2 parts Ultramarine Blue + 1 part Alizarin Crimson) + Cadmium Yellow Medium + Cadmium Orange + White. 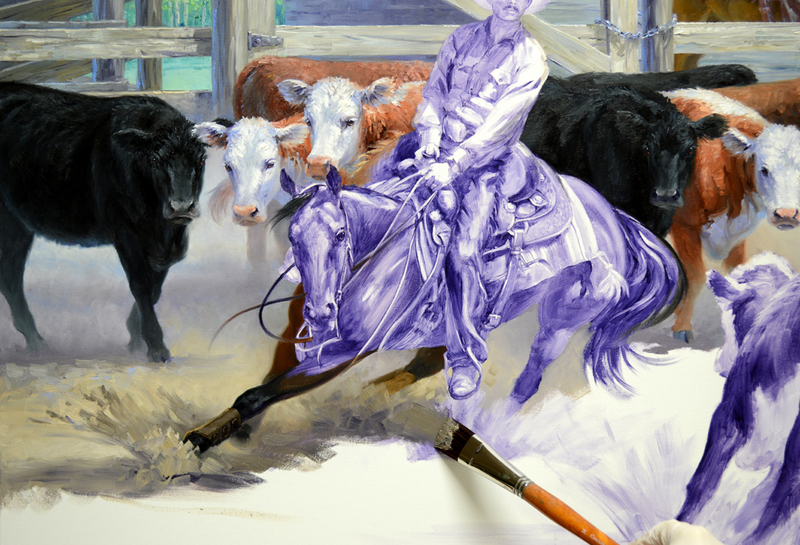 We begin painting Chesty by blocking in her legs and the flying dust around them. Working in this sequence allows me to fade all but the very front leg into the haze. 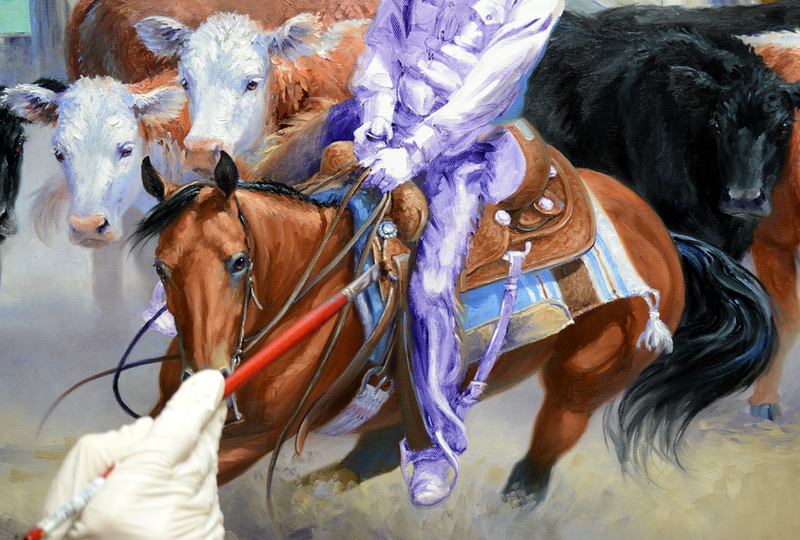 The left, or near, foreleg has more detail which makes it come forward of the others. 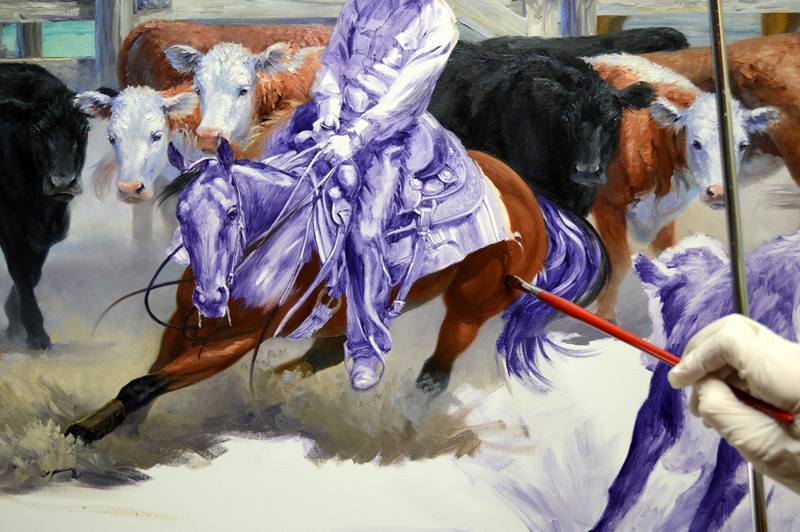 The left side is called the ‘near’ side because that’s the side the horse is mounted from. Why the left side? In the middle ages, when carrying a sword was the standard practice, most men were right handed and carried their weapons on their left side with the hilt forward for a quick draw. 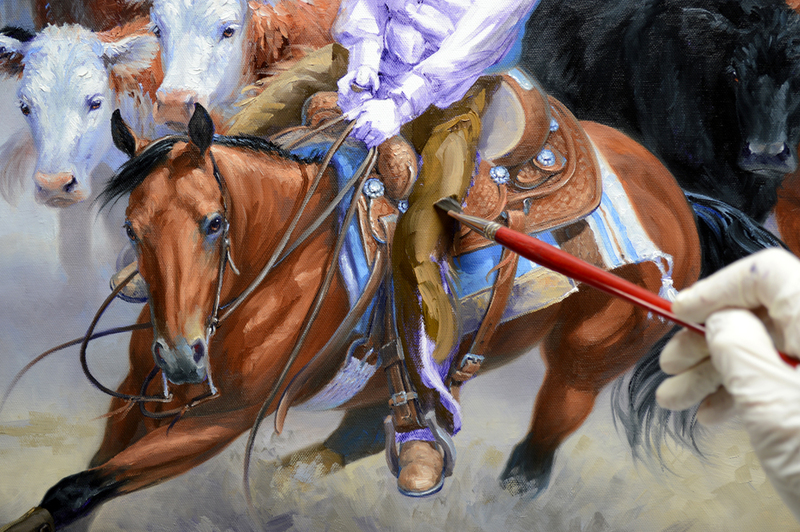 Mounting from the left reduced the rider’s chance of entangling himself in his sword or stabbing his horse! The tradition of mounting from the left side continues to this day. 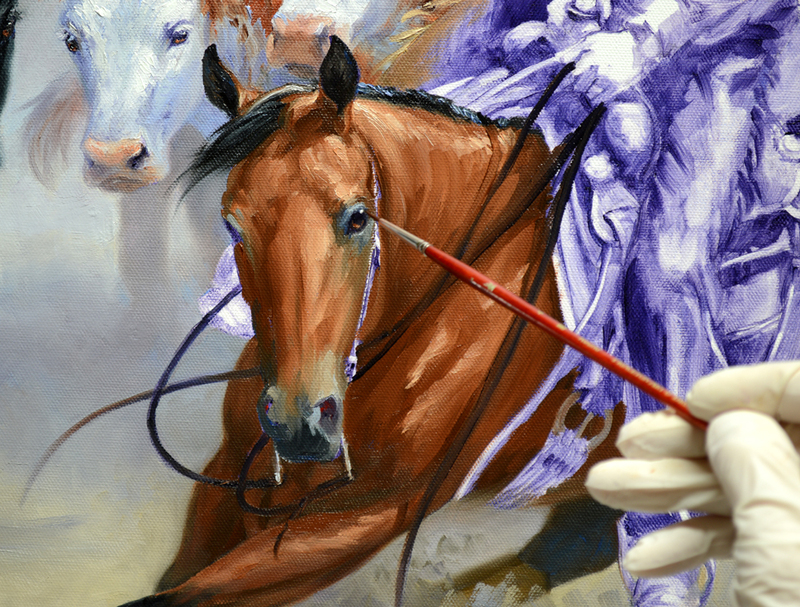 After getting her chest covered, the bit and reins are pulled into the wet paint. My left hand is braced against the unpainted part of the canvas, then I rest my right hand on top of it. This gives me a steady support as I delineate the bit. Don’t forget, you may click on any of the pictures to view them larger. Now I move to Chesty’s muscular hindquarters. 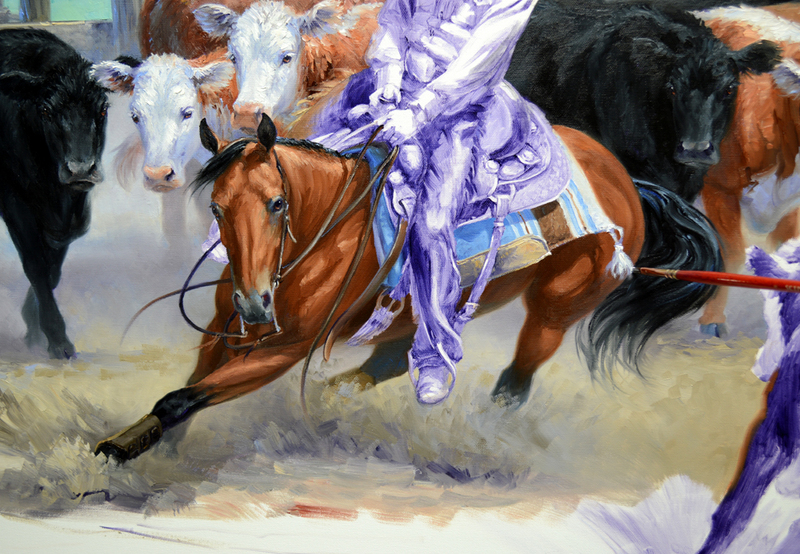 The tassel on the saddle blanket casts a shadow down the side of her hip. VIDEO DEMONSTRATION: Blocking in Chesty’s neck and head. Please keep in mind when I give the color recipe for Chesty’s coat, I forgot to mention that White is added to make the lighter shades. OPPPSSSSS! 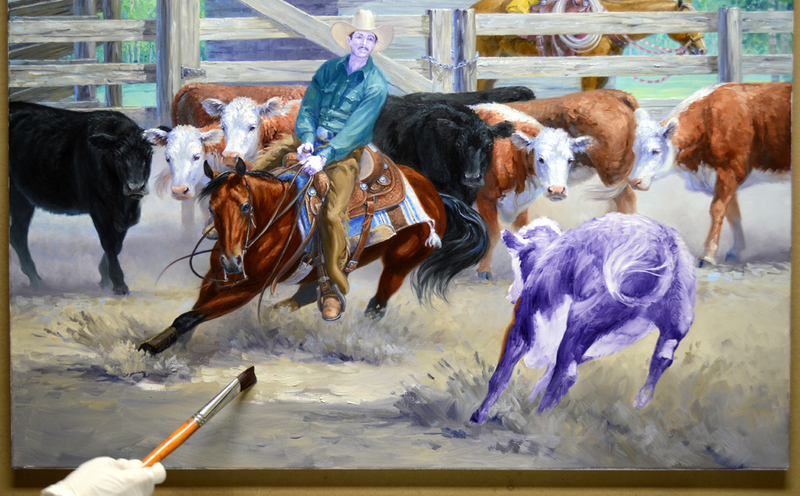 Now we’ll begin adding the highlights on Chesty’s shiny coat. Bill mentioned that Chesty had “Kind” eyes, not like many cutting horses that glare and show the white of their eye when working a cow.